In 2007, on Monday May 14th, Bear Grylls teamed up with Giles Cardoza and, with the backing of the GKN Mission Everest team, flew over Everest by paramotor! 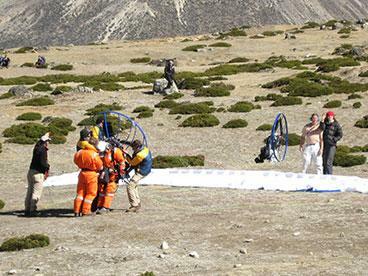 This achievment led to Bear Grylls claiming the title of first man to fly over Mount Everest by powered paraglider. 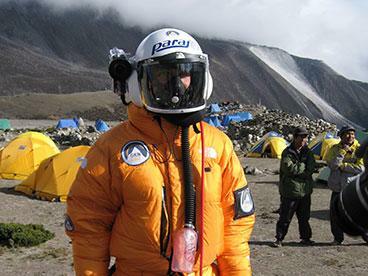 Bear and fellow pilot Giles took off from Everest base camp, situated at 14,500 feet in Nepal. Both had specially developed paramotors. At 28,000 feet, a fault in Giles’ machine ended his mission just 1,000 feet below the summit, forcing him to glide back to safety. Luckily, Bear was able to continue to ascend until, at around 9.30 am, he reached the height of 29,500 feet to claim this extraordinary title! Bear raised $1million for Global Angels projects in Uganda, Sierra Leone, Kenya and Mozambique; 100% of which went towards providing water, food, education, medicine and housing for kids and their communities.